The composition of TexasDesal’s Board of Directors and staff reflects the organization’s stakeholders: cities and other water suppliers, business water-users, and individuals and organizations with expertise and/or products related to the desalination industry. Kyle Frazier has been involved in politics and governmental relations for more than thirty years, beginning with the Mark White for Governor Campaign in 1983. Since that time, he has successfully represented a diverse client base at state and federal levels. 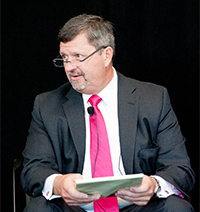 Mr. Frazier is the Executive Director of the Texas Desalination Association, which he co-founded in 2011. He also serves other clients’ legislative and public policy interests for water desalination, healthcare, alcohol regulation, and excise and sales taxes as Kyle Frazier Consulting, Inc. He has served as a board member to Keep Texas Beautiful and the Woman’s Advocacy Project. Jorge Arroyo, Freese and Nichols, Inc.
Gilad Cohen, IDE Americas, Inc. Interested in joining the board or serving on a committee? Contact Tabitha Ledford at 512-322-0404.